Dane Prairie (township 132, range 42) was organized as a civil town ship by the county commissioners on May 10, 1870. Practically all of the twenty signers of the petition presented to the board were natives of Den mark, and this fact sufficiently accounts for the name which was given the township. Their names follow: Niels Thygesen, Ernst Trochmann, John Christian Petersen, John C. Clemmensen, Hans Jacobsen, Gilbert Abrahamson, John Anderson, Christian A. Glorvigen, Peder Matzen, Ole Larson Crikken, Isak Carlsen, Ole Johansen Kasa, Hans Jensen, Hans Peter, Hanson Stevns, Lars Christiansen, Christian Hanson, Thor Thorsen Hille, John Grimseth, John Millstrom and Niels Millstrom. The first election was held at the house of J. Grunseton the 28th of the same month. The tax duplicate prepared in 1869 lists fourteen taxpayers, to-wit: Thomas McClue, Orcut Boardman, Henry Van Arman, Mary A. L. Flover, O. T. Langen, Johan Grimseth, S. H. Smith, Ashael D. Southworth, John I. Merriam, George B. Wright, Ester Gilman, Ole Johnson, Hans Olson and Ole Christopherson. Most of these taxpayers were non-residents of the township. 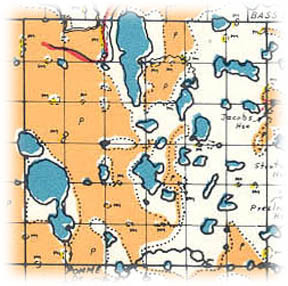 Dane Prairie township has more lakes within its limits than any other township in the county; in fact, there is not a single section in the township which does not have at least one lake in it. By actual count there are seventy-five lakes wholly or partly within this township, the largest of them being Wall, Swan, lndian, Larson, Lye, Fossan, Rosvold, Bronseth and Aanesnes. One of the largest lakes in the township in former years, Stang, is now prac tically dry, having been drained through Wall lake to the Red river. It is interesting to know the difference in the altitude of these lakes above sea level; Rosvold is 1,309, Indian 1,278, Swan 1,193 and Fossan 1,245. Red river dips down into this township in section 5 and all of the northern and western portions of the township are in the basin of that river. The Pomme de Terre river reaches up into the southern part of the township and drains a portion of it. There has been only one townsite platted in the township, Wall Lake Point, in section 4. It was platted for Lauritz L. Berg and his wife, Hilda, by Martin Aalberg and recorded on May 6, 1910. It stands on the western shore of Wall lake. The town hall is located in the extreme northwestern corner of section 22. The only church is located in section 21 and dates back to the early days of the township. The first public cemetery was very probably the one located in the eastern part of section 28. The Great Northern railroad runs across the southwestern corner of the county. Places of birth for Dane Prairie Township in the 1905 state census.